Welcome to the world wide web page devoted to disseminating information on the science of volcanic lakes! This page contains information on how volcanic lakes work and details about many specific lakes. Tiwo Nua Muri Koohi Fah- The lake of "young men and maidens"
pH=0.3. The yellow floating debris is sulfur. A volcanic lake is a cap of meteoric water over the vent of an active volcano. Only 12% of the world's 714 Holocene-aged (~10,000 yrs old) or younger volcanoes listed in the Catalog of Active Volcanoes of the World have such a lake (Rowe et al, 1992). What makes volcanic lakes so rare is that their presence and expression require a special balance ofvolcanic heat flux versus atmospheric cooling and precipitation versus evaporation. The volcanic structure (e.g. substratum permeability and crater shape) is also important, but it is the former parameters- the endogene and exogene forces at work in a given crater subenvironment- that condition the lake's chemistry which in turn is indicative of volcanic activity and geo-hydrochemical processes. reprinted from Pasternack and Varekamp, 1997, Bull. Volc. 58:7:528-538. A genetic classification scheme for volcanic lakes has been developed based on characteristics of natural lakes and models of ideal lakes (see Pasternack and Varekamp, 1997). Classifications for many environments exist, but most rely on "looks" (i.e. morphology or descriptive characteristics). This problem has been avoided with volcanic lakes by basing the delineations on process thresholds, not arbitrary delineations in form. This approach has revealed quantitiative delineations on 3 levels of classification- absolute energy, hydrodynamic mixing regimes, and chemistry. To explore the physical processes governing the delineations on the first 2 levels, a perfect mixing, steady-state energy/mass balance model was used. Energy terms used in the model include volcanic/geothermal inflow, radiative fluxes, conductive heat loss at the lake surface, evaporative heat loss, and the energy used to heat entering meteoric waters. These fluxes are equated and then solve iteratively for a steady-state lake temperature, with the additional constraint of maintaining mass balance for water. The dominant parameter that controls heat dissipation and thus lake temperature is lake surface area. Precipitation rate and catchment area determines a lake's survival potential in terms of maintaining water balance. By searching for process scenarios that break down the above model it was possible to find real delineations in lake types. 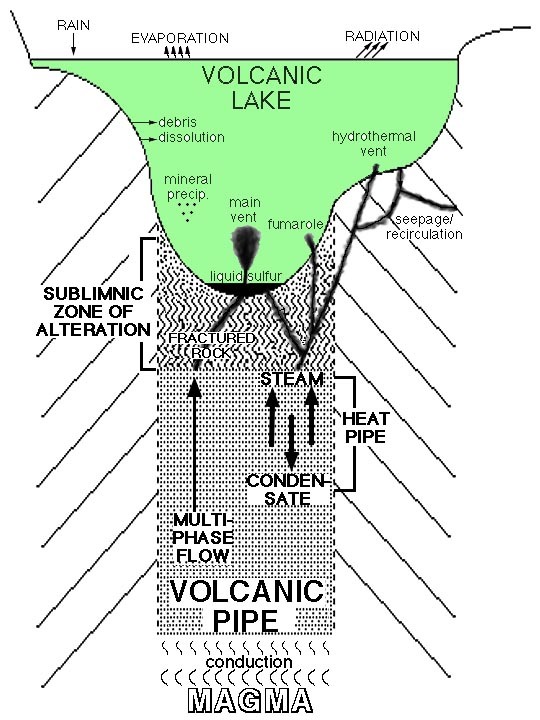 "Hot Acid-Hyperbrine" volcanic lakes are those whose volcanic/geothermal input is so large that no steady state condition is attainable under common atmospheric conditions. "Acid-Brine" lakes are those that exhibit near perfect mixing and can thus quickly achieve energy/mass steady state according to the principles of the model. "Acid-Saline" lakes have stable buoyant jets that violate the perfect mixing assumption. "Acid-Sulfate" and "Bicarbonate" lakes receive even less energy and may have buoyant plumes or be stably stratified. Finally, "Neutral-Dilute" volcanic lakes have no volcanic input and are thus hazard-free. Through its elucidation of the similarities and differences between types of lakes, including which ones are subject to which hazards, the classification aids in using easily measured lake characteristics (i.e. temperature, pH, and TDS) for initial volcano and lake hazard assessment. To further explore the range of chemical conditions among volcanic lakes, a database of 373 lake water analyses from the published literature was compiled and analyzed using several statistical and geomical analysis tools. Compositional variations are influenced by the flux of magmatic volatiles and / or deep hydrothermal fluids. The chemistry of the fluid entering a lake may be dominated by a high-temperature volcanic gas component or by a lower-temperature fluid that has interacted extensively with volcanic rocks. reprinted from Varekamp, J. C. et al., 2000, J. Volcanol. Geotherm. Res. 97:161-179. Precipitation of minerals like gypsum and silica can strongly affect the concentrations of Ca and Si in some lakes. A much less concentrated geothermal input fluid provides the mineralized components of some more dilute lakes. Temporal variations in dilution and evaporation rates ultimately control absolute concentrations of dissolved constituents, but not conservative element ratios. Most volcanic lake waters, and presumably their deep hydrothermal fluid inputs, classify as immature acid fluids that have not equilibrated with common secondary silicates such as clays or zeolites. Many such fluids may have equilibrated with secondary minerals earlier in their history but were re-acidified by mixing with fresh volcanic fluids. A new parameter to characterize these acid fluids has been developed with the "degree of neutralization" as the central concept. This leads to a classification of gas-dominated versus rock-dominated lake waters. A further classification is based on a cluster analysis and a hydrothermal "speedometer" concept that uses the degree of silica equilibration of a fluid during cooling and dilution to evaluate the rate of fluid equilibration in volcano hydrothermal systems. To assist scientists, students, and the public in accessing information on volcanic lakes, a bibliography of publications relevant to volcanic lakes has been compiled and is now available on this site. Presently, the bibliography is a text file listing with 212 entries from peer review journals, meeting proceedings, the CVL newsletters, and other appropriate sources. To submit entries for inclusion in the database, send an e-mail to the address at the bottom of this page. Please send entries in the same format as used in the bibliography. No attempt will be made to read articles prior to adding them to the listing, but inappropriate submissions will not be accepted. Keli Mutu volcano on the island of Flores in Indonesia is unique among volcanic lakes because it is home to 3 lakes, with 2 barely separated by a natural, narrow rock partition. Each lake has aunique chemistry (for example, pH's ranging from 0.3 to 3.2), and thus each exhibits a different vibrant color. To learn more about the lakes at Keli Mutu and to see what kind of science is involved in studying volcanic lakes, check out this page. The hot acid-brine volcanic lake covering Ruapehu in New Zealand is one of the most thoroughly studied and monitored volcanic lakes in the world. Eruptions through the lake occur relatively frequently, changing the physical dimensions of the lake and posing a constant threat to human activities in the area. Crater Lake is a neutral-dilute volcanic lake that is now one of the largest freshwater lakes in the world. In September 1996 Crater Lake National Park hosted the AGU Chapman Conference on crater lakes, terrestial degassing, and hyperacidic fluids in the environment. A rapid, massive release of carbon dioxide gas from Lake Nyos killed almost 2,000 people in August 1986, sparking a hot debate over the cause/mechanism of the release. Ten years later a lot more is known about the lake's chemistry, the effects of the release, and possible mechanisms, but the debate over the exact trigger continues. In late 2001 a webcam was placed at the lake to monitor the degassing effort- see the lake for yourself in real-time. A hot acid-brine volcanic lake whose chemistry has been monitored for many years. A hot acid-hyperbrine volcanic lake. This is a very active volcanic lake whose classification is unknown due to limited data. In 2005 it has been undergoing rapid volumetric and temperature changes. PBS "Savage Earth: Out of the Inferno"